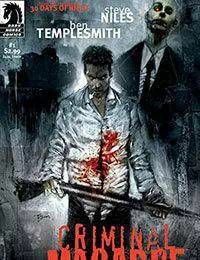 From the creators of 30 Days of Night, the smash hit that Wizard magazine called the #1 Breakout Event of 2002, Dark Horse proudly presents: Criminal Macabre: A Cal McDonald Mystery #1 of 5. Recently relocated to Los Angeles, investigator of the weird Cal McDonald finds himself in police custody, implicated in a case involving the elite of LA. Hollywood types are rubbing elbows with vampires and werewolves, and things keep getting even weirder. With his zombie sidekick MoLock--whom Cal shoots three times in the first issuethe most foul-mouthed and hard-living private occult detective takes on every freak LA has to offer.